Two years ago I wrote about the British public’s reluctance to get involved in military action. At the time David Cameron said “the well of public opinion was well and truly poisoned by the Iraq episode.” He was right then; over the course of actions in Bosnia, Kosovo, Afghanistan, Iraq and Libya there was an increase in the public’s apprehension towards getting involved in military action abroad. However, the events in Paris, a city so close in distance and culture to our own, have brought about a shift in public opinion. Of course, there is much more to making decisions about going to war than public opinion, but it nevertheless plays an important role in understanding the willingness of a nation to get involved. The scars of the Iraq War are still prominent but the threat of ISIS may be overriding other concerns. 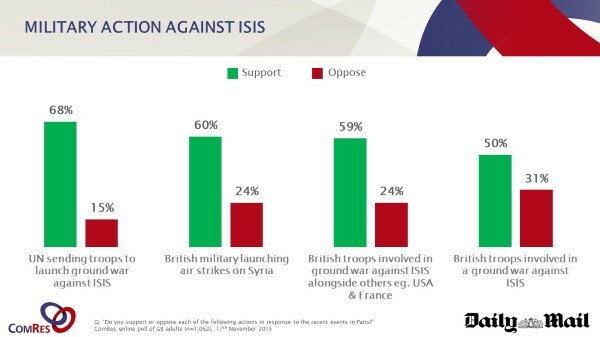 New ComRes polling this week reveals that six in ten (60%) Britons now support air strikes on Syria. However, more startling are the levels of support for sending in troops on the ground. While already half (50%) back sending British troops to launch a ground war against ISIS (compared to 31% to oppose it), support rises further if we were to go in alongside US/French allies (59% support) or if the UN were to launch a ground war (68%). There is a lot that influences public support for military involvement, the role of international organisations being one key factor which can help raise public backing. Other influences include: the perceived national interest, immediacy of the threat posed, particularly striking images in the media, ties and relationships of the country in question to the UK, the type of action being proposed and the current economic situation. The attacks in Paris have brought the threat of ISIS to our doorstep, and it is perhaps this proximity that has driven public opinion. Two thirds of Britons think a Paris style attack in the UK is “inevitable”. Eight in ten (78%) are now worried about a terrorist attack happening in Britain, representing a 23 point rise from 55% who were worried in August of last year. With this concern so dominant it is not surprising then that a majority (69%) think military action is the only way to stop ISIS. The images and stories from Paris splashed over newspapers, TV news and social media have brought shock to the country. The immediate aftermath of such an attack is bound to illicit strong reactions and with concerns about how such attacks can be prevented – less than half (44%) are confident security services can prevent an attack – the public are looking to other safety measures. Going beyond simply bombs and troops on the ground, there are calls for tighter security of British borders. More than half (55%) are in favour of refusing entry to Syrian refugees, and closing Britain’s borders to the EU, stopping anyone entering the country permanently (53%). A large majority (79%) also support closing all borders between European countries – effectively ending the Schengen area. Decisions of national security are about more than just public opinion, and lessons should also be learnt from past endeavours. But for now at least, there is backing in the well of public opinion for a military response. It is by no means permanent or unconditional, but it is there. A version of this article first appeared on the Telegraph comment pages.